Algebra The study of equations using variables. At Capitan High School, the study of algebra is broken into Algebra 1 and Algebra 2. Algebraic expression A collection of letters (variables) and real numbers (constants) combined using the operations of addition, subtraction, multiplication, division, and exponentiation. Base In an expression of the form xn, x is the base and n is the exponent. Best Fit Line The straight line that most closely approximates the data in a scatter plot. Box and Whisker Plot A diagram that divides a set of data into four parts: lower quartile, below the mean (average), above the mean, and highest quartile. Calculus The study of infinitely small changes in slope and area, used to solve complicated real-world problems that cannot be solved using Algebra, geometry, or Trigonometry. Centroid The point in a triangle where the medians of the triangle intersect. Click here for an animated example of the centroid. 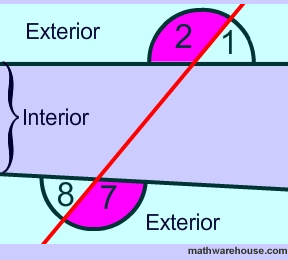 Central tendency The tendency of data to be grouped near the center of the data. Measured using mean, median, and mode. 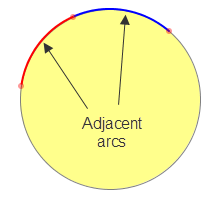 Circular function The trig functions, because they can be defined as points along the radius of the unit circle. 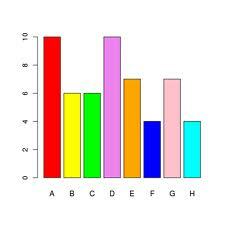 Circle Graph A graph that represents the frequency of data as slices of a circle. The size of each slice represents the frequency, usually recorded as a percent. Circumcenter The point in a triangle where the perpendicular bisectors of the sides of the triangle intersect. Click here for an animated example of the centroid. Closed interval An interval that includes both of its end points. Cofunction In trigonometry, the function pairs: sine and cosine, tangent and cotangent, and secant and cosecant. Completing the Square One method used to solve a quadratic equation. Other methods include factoring and the quadratic formula. 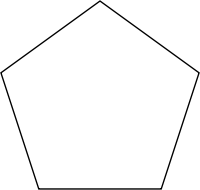 Concave polygon When a diagonal contains points outside the polygon. Congruent Objects that are the same size and the same shape. The symbol for congruent is an equal sign with a squiggle over it. Conjecture The conclusion reached in a math statement based on reasoning - a guess based on observations. Construction Using only a compass and a straight edge to draw a geometric figure. Convex polygon No diagonal contains points outside the polygon - all the vertices of the angles point away from the center of the polygon. Coordinate of a point On a number line, it is the distance of the point from the origin. On a coordinate axit is is the pair (x, y) that defines the location. Coordinate pair A pair of numbers of the form (x, y) that gives the location of a point in the coordinate plane. Coordinate Plane Formed when two number lines intersect at right angles. The x-axis is the horizontal axis and the y-axis is the vertical axis. The two axes meet at the origin (0,0). Click here for another explaination. 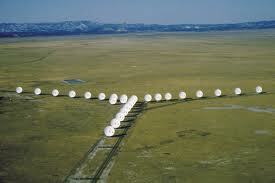 The VLA west of Socorro, NM, is a group of 27 radio telescopes that are coplanar. Correlation A trend between two sets of data. A trend may show positive correlation (both sets of data get bigger together) negative correlation (one set of data gets bigger while the other gets smaller), or no correlation. Corresponding parts Matching sides and angles in a polygon. For a simple game on corresponging parts in a triangle, click here. Corollary A statement that follows directly from a theorem. Once you prove a theorem, the corollary is easily proven.